A well-made loaded baked potato can set the tone for a hearty American meal. While nothing beats the classic side dish, a pizzeria chain is putting a unique spin on loaded baked potatoes that have us turning our heads and reaching for a slice… or five. Oggi’s Sports | Brewhouse | Pizza is taking the classic side dish and turning it into an all-star bite by turning it into a pizza. The pie is topped with slices of baked potatoes, and piled with mozzarella and cheddar cheese. 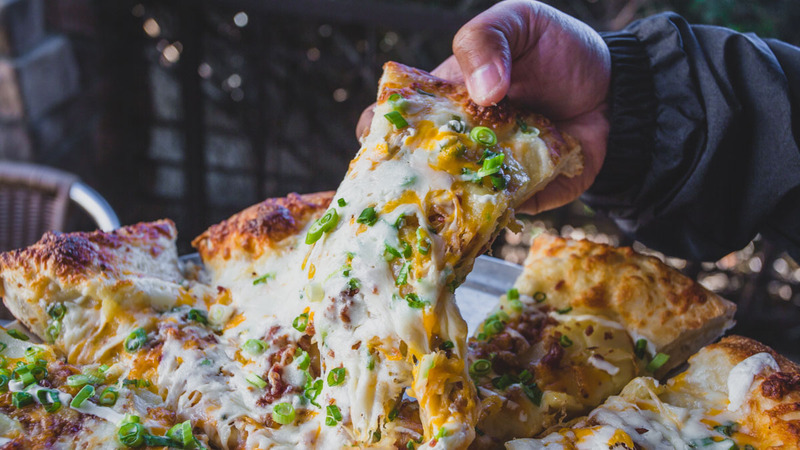 To complete the essence of a loaded baked potato, the pizza is finished with bacon bits, green onions, and a generous drizzle of sour cream. For those with a sweet tooth, Oggi’s is also offering a special dessert pizza that’s layered with honey ricotta cheese, strawberries, raspberries, and blackberries. It’s then finished with a fresh berry compote. You can even request to have it a la mode with a scoop of vanilla ice cream for maximum dessert purposes, of course. Man, in a perfect world, every dish would be crafted in pizza form. One day, Pete. Until that day, the Loaded Baked Potato Pizza and the dessert pizza are available at all the Oggi’s locations to tide us all over. Written by Peter Pham. Published with permission from FOODBEAST.com.